Last Saturday, I joined in the ribbon cutting ceremony of Autistic artist Julyan Harrison's in Tagaytay. 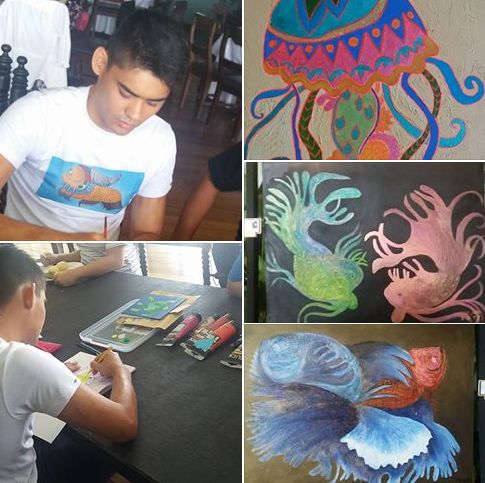 He shares his love for painting at the Fun and Purpose 2 Art Exhibit at Balay Dako. His first solo exhibit runs from November 11-19, 2017. Diagnosed with autism at the age of 2, Julyan’s parents were determined to get him on countless hours of multiple simultaneous therapies to enable him to function despite his severe communication and behaviural limitations. Julyan was then at the lower end of the autism spectrum and cannot spontaneously communicate. His mother, Rachel Harrison, a former flight attendant, officially opened 26-hectare Zambawood resort in 2014 as a social enterprise that would provide Julyan and others like him with a sustainable livelihood through vacationers who book the resort to enjoy its nature-infused surroundings of beaches, forestland and mountains. Today at the age of 25, Julyan has emerged as an accomplished artist in his own quirky way. 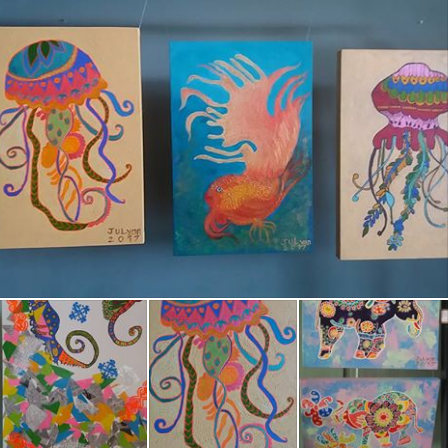 What began as Julyan's art therapy turned into works of art depicting the seas and animals. Art channeled his autistic behaviors into an expressive, creative outlet. Gifted in art, he has created works with established abled artists and made his first bamboo bicycle in the resort’s latest initiative to promote ecotourism. His works reflect more depth and confidence without completely losing its pure innocence. He has created artworks with established abled artists and made his first bamboo bicycle in the resort’s latest initiative to promote ecotourism. Indeed, Julyan has come a long way. He continues on to find true fun and purpose, even in his "ordinary simple" activities by the beach at Zambawood in Zambales. He feeds free-ranging chickens, grows and harvests organic vegetables for the in-house cafe, and mixes materials for compost on his Pine Beach Farm. He also surfs in the sea, rides his all-terrain vehicle and helps with meal preparations under the supervision of a trained staff. Children with disabilities are one of the most marginalized groups in our society. While these special children's physical and mental impairments limit their major life activities, parents should aim for inclusion and integration of their special child in the society. In so doing, it will have a lifelong impact on their learning, potential economic, social and human development. 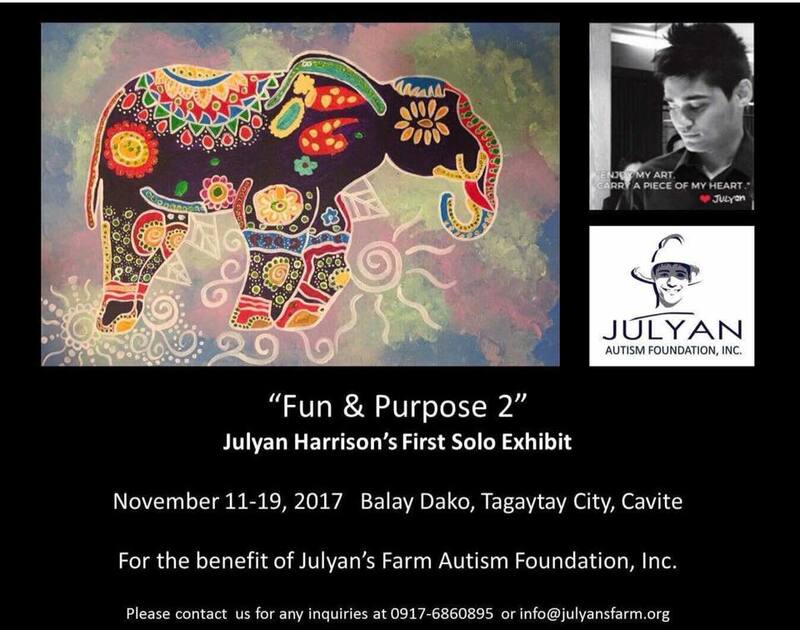 Fun and Purpose 2 Art Exhibit is meant to showcase the artistic talents of children on the autism spectrum. Proceeds of the art sale will help fund activities that Julyan's Surf BnB at Zambawood promotes. The foundation supports education plans that take autistic children into account. Do drop by Balay Dako by Antonio's in Tagaytay City and see the world in Julyan's eyes!